Sometimes you don't know what you don't know. 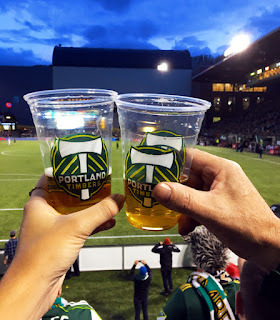 I had never been to a Portland Timbers match and I honestly had no real interest in changing that. Nope. I watched as breweries, pubs, taverns and other businesses jumped on the Timbers bandwagon. Never bought in. But along came a smarty pants, busy body friend who likes soccer. She couldn't understand why I hadn't been to a game. "What's wrong with you? It's fun! You should go to a game. Will you go to a game with me?" Against my better judgment, I agreed. Tickets were acquired and we waited for game day, which was Saturday. Watching the weather all week, it looked like we'd be drenched. Didn't happen. A lot of advice was passed out along the way. I was supposed to look up and learn the songs and chants. On game day, I was advised to leave my newbie scarf at home and wear one she would provide. "And don't you dare wear blue," color of the visiting bums from Dallas. I never realized the extent to which the area around Providence Park has become a sort of pregame festing area for fans. It's tailgating without the parking lot mess and open grills. Bars and foodie joints near the stadium were fairly well packed in the hours before the game. Our first pregame stop was a dive bar where we met up with (her) friends, a flock of pool playing millennials. The joint reminded me of busted up places where I drank illegally when I was in high school back in the dark ages. Except no draft beer. Only cans and bottles in this dump. Not many choices, either. My first (and only) beer was a Rainier. Nasty, inauspicious start. Shortly, most of the group departed for the stadium. They had acquired wristbands earlier and were off to claim their places in the Army. Our tickets were in the same area, but on the reserved side. We had time for more beer, thank goodness. Where to? We wound up at the Civic Taproom, which was packed. One beer and we headed to Uno Mas for some pre-match food. And more beer. The pregame shenanigans inside the stadium were both funny and charming. Timbers fans holding up keys and chanting for the visiting bums to go home. Good stuff. Then the National Anthem and the twisting and twirling of scarfs at the end of each line. That was endearing. I might go back just for that. Between the chanting, drinking and chatting back and forth, I'm not sure how much of the game my millennial friends caught. One of the great things about soccer is the nonstop action...well, nonstop until someone flops and they have stoppage. But constant action is a drag on social time. My friends didn't seem to be having it, chatting each other up incessantly. At the half, we moved over to where (her) friends were sitting in the Army, a few rows from the front. There's a lot of noise, pageantry and action there. My pal suggested that I grab a flag and wave it around. She provided brief instruction. It was all good until I nearly conked a nearby fan on the head. That was more or less it for the flag. As for the match, the Timbers scored two goals right in front of us. The first one I saw vaguely as I was headed out the tunnel for a restroom break. My friend was headed back in with...more beer. Perfect. The second goal happened as we watched from the Army. Brilliant. Confetti blast off. Dallas had some shots on goal, but never got much going. Timbers 2, Dallas 0. Here's where we might have been smart. Having consumed a fair amount of beer over the course of several hours, maybe more beer wasn't the best idea. But the postgame celebration was on and, anyway, getting transit out of there right after a game can be dicey. We headed over to the Kingston for...more beer. Pure genius. An hour later, someone suggested we stumble over to the nearby Mazatlan. Why not? After all, "We're still standing." So the collective somehow traversed the street, entered the bar and occupied a table. Amazing. That positioned us to place orders for...more beer. Fortunately, snacks were involved. Wise. And karaoke. Not wise, but highly amusing. It was half past midnight when we (finally) requested a Lyft out of there. Kind of surprising how quickly the driver materialized. She was nice, clearly had some experience carting drunk folks around in the early morning hours. By now, the rain that was supposed to have arrived earlier was pinging down softly, symbolic end to a perfect evening. There's something innocuous about these Timbers games. The nonstop action is a pleasure to behold and maybe what honest sport is all about. The players are fit and agile. The lack of timeouts means fans aren't constantly barraged with obnoxious ads. And, of course, the fan participation. It's an appealing combination of good stuff. I now realize that experiencing a Timbers match in person is the key to getting interested. Watching on TV just doesn't do the experience justice. So I thank my kind (and awkward) millennial friend for dragging me out to the park and her friends for putting up with me. Good folks, they are. Love it, Pete! Both that you finally went to a game and you were able to convey the full experience so expertly. I don't often go to games which are fun, but do often hunker down at Mongers to watch, surrounded by folks that are as into it as the ones at the game. Join us sometime! Thanks, Kris. I might just do that.